When you get to a reputation of 3000 you earn the privilege to cast close votes. According to the help pages, you're not supposed to raise a flag anymore when you get this privilege, but to just vote for closing a question. It means that basically, I can't get the Marshal badge, although, considering my work on the close-reviews queue, I'm more entitled to it than before. Is there a reason to ever raise a flag once you reached 3000? Is there a way to get the badge? Yes, you can still get the Marshal badge after getting Close Vote privileges. There are other ways to flag that are outside of close flags. I previously outlined some of this on Meta Stack Exchange, but here are some other ways. Here you can flag an answer as "Not An Answer" - these would be answers that should be comments, or are "Thank this worked" answers or even new questions that have been incorrectly posted as an answer. 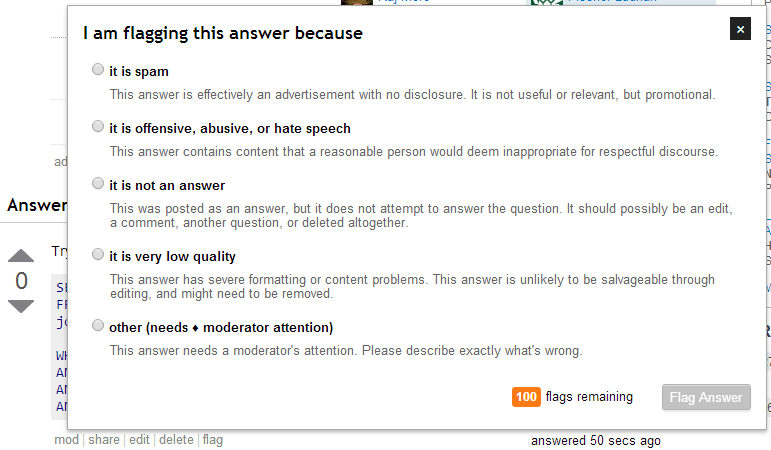 You can also raise "Other" flags on questions/answers that might need moderator attention that cannot be handled by the community. These types of flags go into the moderator queue for review. There are many things that can be flagged which will help you get the Marshal badge. You can flag posts for more things than just being off-topic. If you flag spam, offensive posts, flag answers that are not answers (but new questions or comments, etc), or find sock puppets and use the other option to inform a moderator, etc. etc. etc. you also earn helpful flags. But do remember the badge is there as a nice extra reward for having done a good job, not the goal itself. Not the answer you're looking for? Browse other questions tagged support flags vote-to-close flag-badges . Is flagging a question the same as voting to close? Should dupe hammer users be given the option to NOT instantly close duplicates?